In the camping area, we were not alone, though. A big Volvo truck was parked there, also. 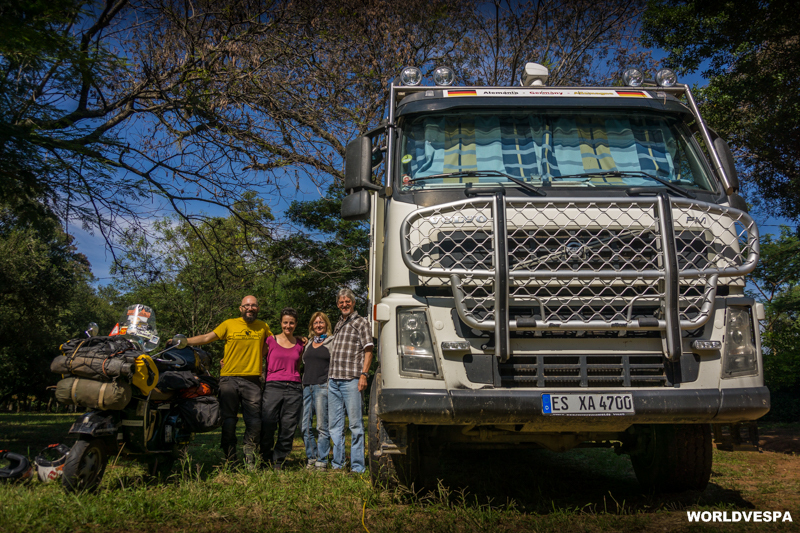 It was definitely a traveler’s vehicle and we were curious to meet its owner(s). After we had pitched our tent, a couple came towards the truck. It was Pita and Rudi, a German couple of pensioners who had been traveling for the last few years around the world (www.menrad-international.com). We spent some time talking and exchanging travel experiences, but we all soon ran into our “homes” because the mosquitoes of the botanical garden were really ferocious and started sucking our blood without showing any mercy! At about 19.00-19.30, the guard appeared and asked for our names so that he could register us to the official papers of the administration! He reassured us that the place is safe and went to sleep in a small house some meters away. The next morning, Stergios and I talked about our options for the day: none of us wanted to leave our stuff there and go and none of us wanted to use the toilets of the place. We had no other solution but to go. Those who can lock their stuff are really lucky in situations like this! We headed towards the canteen which was 50 meters from the place we were. There, our new friend Analia was waiting for us with some traditional Paraguayan breakfast! Analia was the owner of the canteen and the previous day, when we passed in front of her to go to the camping area, she saw us and welcomed us. She and her husband, who is a well-known enduro race rider, used to travel a lot on motorcycles and Analia was really happy to meet us! We were also very happy to meet her! She was the first person to talk to after our bad experience with the “crazy” hotel owner in Aregua (see Paraguay (part01)) and it was about time to meet a nice person at last! Our first impression was that she is very kind and we were right! She prepared a traditional recipe, “mbeju” (like a pancake made of mandioca flour and cheese) for us and we sat and started talking. After some moments, we had already agreed to be hosted by her and her family! We couldn’t believe how someone who didn’t know us, was so eager to help us! That day was full of pleasant surprises! While we were sitting and chatting with Analia, we heard the sound of a vespa’s engine! Two guys on vespas appeared and came towards us. We started wondering how they knew we were there! Soon, our question was answered: the previous day, while searching for the camping area, we crossed with a guy on a vespa and greeted him. That was the only thing needed! Marcelo (the guy on the vespa) made a quick research on the internet and found who we were. The next day, he and his friend Carlos, came to the botanical garden to meet us! After a while, another vespista came. 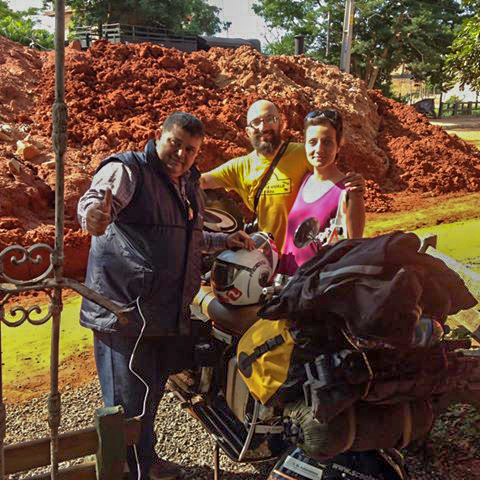 It was Gustavo, the president of the Vespa Club of Paraguay. And that’s how our story in Asuncion started! 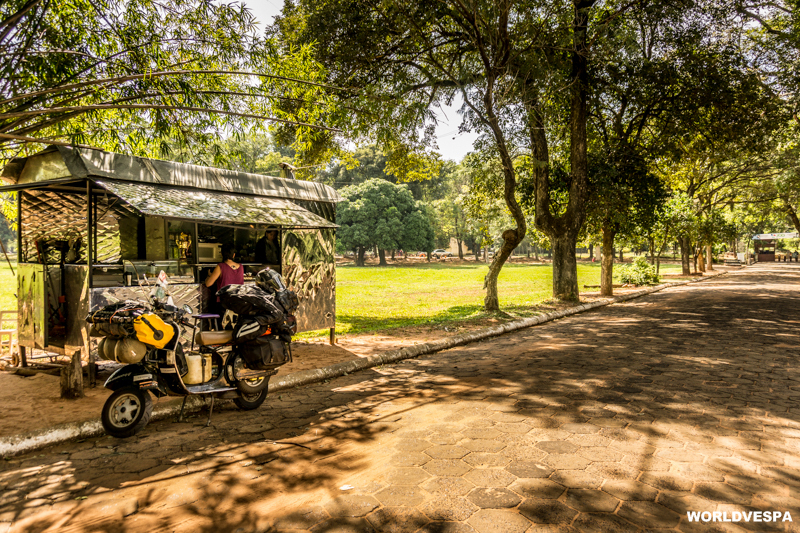 Without worrying anymore about where to stay, we went for a ride with the 3 vespisti. 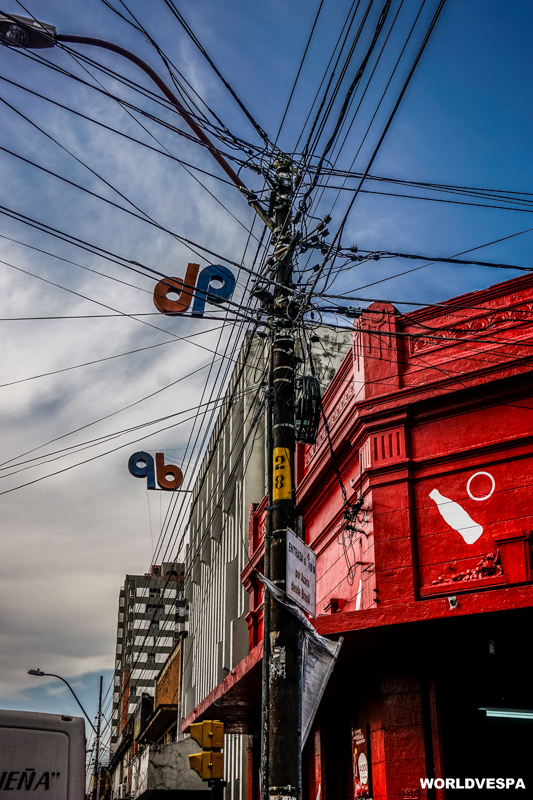 We headed towards the city center, passing from the “Avenida Costanera” and after a first look at the streets of the city, we ended up at “El Mercadito”, a market dedicated to the local cuisine! We were in heaven! The same evening, the plan was to gather at Analia’s place and together with some more members of the Vespa Club we shared some beer and – of course some more traditional recipes! 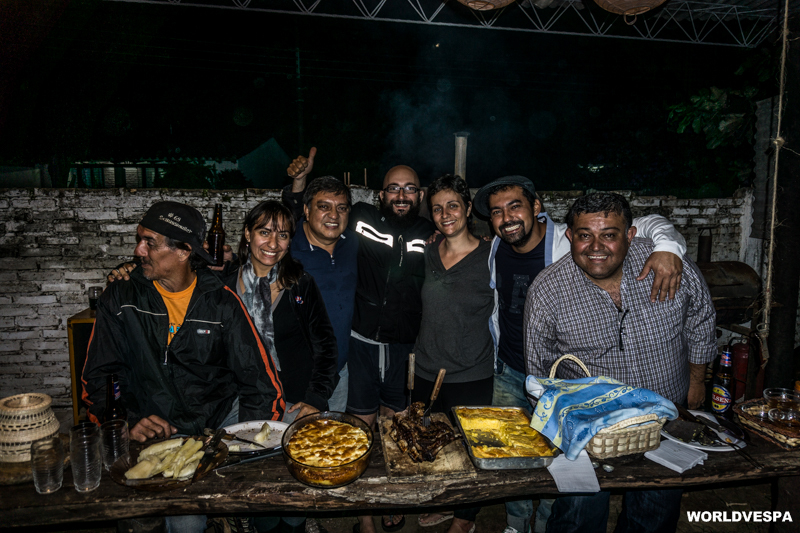 Apart from the “asado” (barbeque) which is apparently a tradition for everyone in South America – Argentina and Paraguay for sure – and it is prepared by the male participants of the fiesta, this time we had the opportunity to try some other recipes that can only be found in Paraguay. Analia’s mother, had prepared the “sopa Paraguaya” and the “chipa guazu”: two delicious savory cakes with ingredients such as corn flour, corn, cheese etc! We were astonished by the Paraguayan hospitality and that was only the beginning! The next day wasn’t that different from the previous one: traditional breakfast – omelet with pieces of mandioca and mate cocido (a strong infusion). 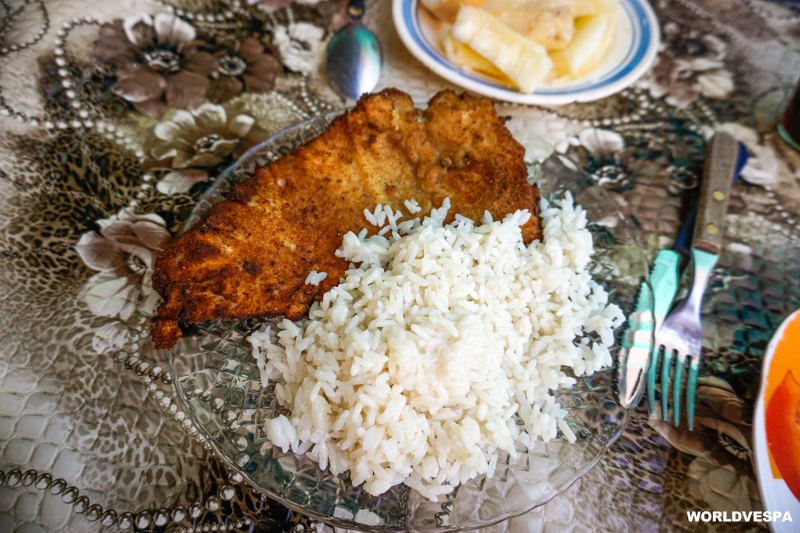 Later, together with Analia and her husband Carlos Jorge, we went to the little port of Remanso and we bought some “milanesa surubi” (river fish schnitzel) by one of the “sinking restaurants”! When the water of the river raises, the small restaurants on the riverside sink and only those who have a second floor stay open and dry(!). In the evening, after saying goodbye to Analia’s lovely 3 children, to her sweet mother, their 5 dogs and their pet pig(! 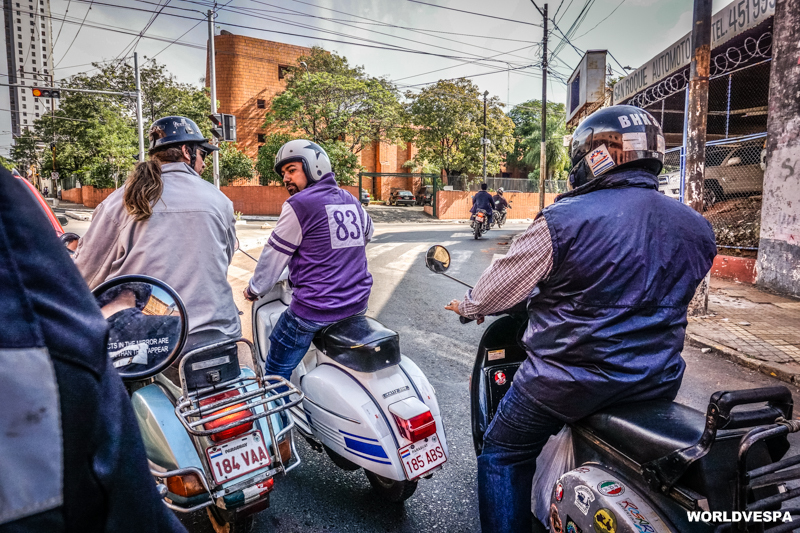 ), we went to the city center to meet with the Vespa Club of Paraguay for the “official welcome”. What else? – Food and beer and vespas! This time, the gathering was at Diosnel’s business. Diosnel is a member of the V.C.P. and a professional collector. He owns a shop with antiquities and he has some vespas and a Mini Cooper. The surprise this time – apart from the smiling people who were waiting to welcome us – was the home made pizza that Diosnel prepared on the barbeque! Delicious and unique! 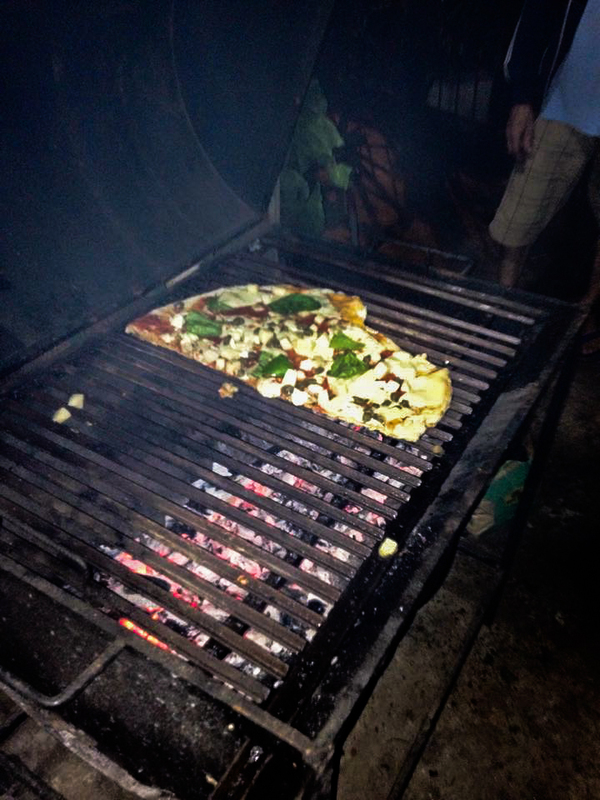 So, we had good company, good food and cold beer…and this was not the exception but the rule in Asuncion! For the next few days, we were hosted by Diosnel and his wife, Elena at their home. We had some more friends in Paraguay! I’m afraid that no matter how hard I’ll try, I’ll be sill missing a name of someone of the kind people we met…Those who wanted to host us – Tenti offered us his country house – those who wanted to buy us a beer, to show us around, to take us out for a drink…we tried hard not to disappoint anyone but they were too many and we were only two! After some meals, dinners and walks in the city, it was time to do some work. We had been trying to find a place to build a new bigger rack for the vespa, so that our luggage could be better tied on it, because every time we were on a dirt road, the pile of luggage would fall off its place. Carlos Jorge arranged a meeting with a friend of him, Jorge Armando, who is a welder and has a flourishing business in Asuncion. Soon, the vespa’s rear rack became wider to support the luggage and from now on, there is a back for the second passenger (me!). We celebrated the new construction with – what else? 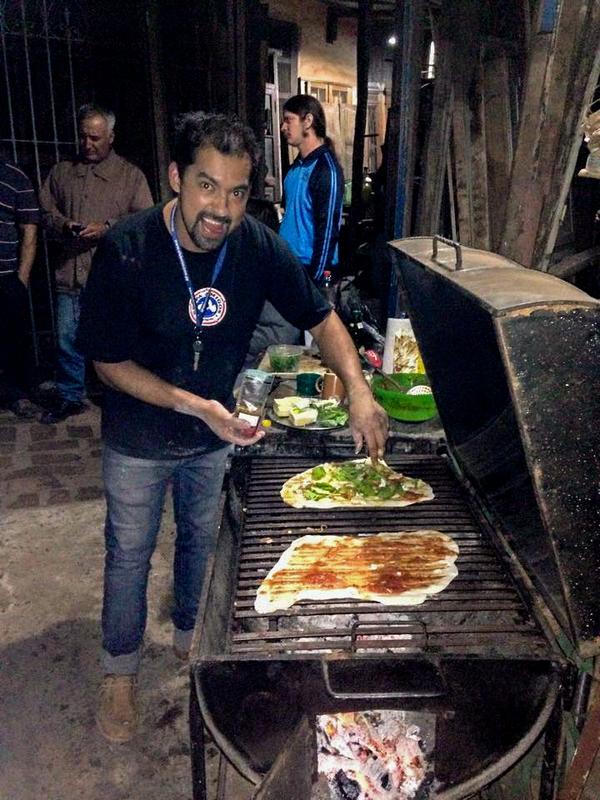 – some “asado” (barbeque) and some wine, there, at Jorge Armando’s business! 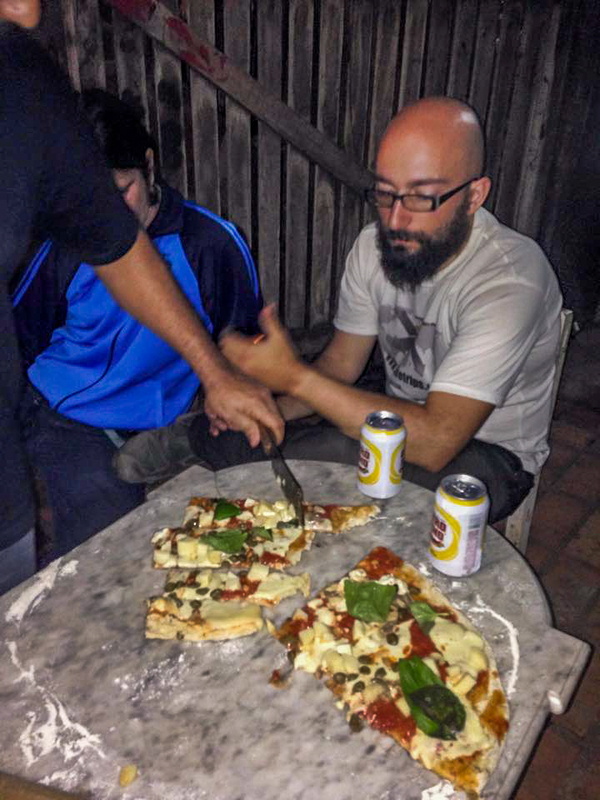 In case you ‘re tired of reading about food and booze, please, don’t go further…this was our stay in Asuncion! We started getting a bit worried about our cholesterol levels! To change a bit the subject, I’ll tell you about our first interview on the Paraguayan Media! It was our first but surprisingly not the last one…but, I’ll return to this later. While we were drinking our wine at Jorge Armando’s place, Analia called and informed us that in one hour we will be interviewed by the Paraguayan TV! Not “asked”, but “informed” us! Small panic attack, held by me because I would do all the talking! Stergios unfortunately has a very basic vocabulary in Spanish – food, vespas, beer – so he relied on my knowledge(! )…In a few moments, we found ourselves talking to a journalist and after some distant shots of us on the vespa, the journalist and the cameraman disappeared explaining not to us (we were still on the vespa trying to understand what the cameraman wanted us to do) but to our friends who were waiting, that they were on a hurry. To cut a long story short, we never saw our interview and we never got a copy of it. We were only told that some friends saw us on TV, but we will never see how Stergios’ hairstyle looked on camera! We were not anxious to leave from Asuncion. We loved the city and it was a great opportunity to work a bit on the blog. Of course, we were also waiting for that package which was on its way from Greece and we were sure that we would soon receive it (we were mistaken!). After some days hosted by Diosnel and Elena, we decided to stay in a hostel. We didn’t want to take advantage of our friends’ hospitality and we also needed some privacy so that we could take our time and work! We found one of the best hostels we’ve ever stayed! It was “Hostal Arandu”. A quiet and nice place with a big kitchen. 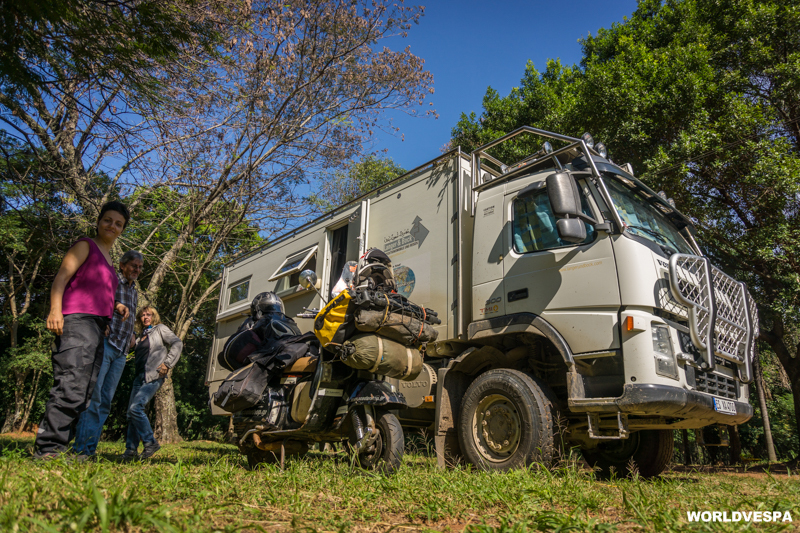 Very clean and luckily, with only a few people staying there, as it was the low season for Paraguay’s tourism! After some time there, we realized we had a routine: shopping, cooking, working, going out and shooting pictures and videos, some more gastronomy…After some more time, we were ready to go! Our butts had been missing the feeling of sitting on the vespa! Leaving from Asuncion proved to be a bit more complicated than we thought…These are the reasons: First, it was the package from Greece. We were looking for it on the website of the Greek post office, using the trucking number they had given us, but the only information we had was that it was stuck somewhere in Brazil. We visited more than once the Paraguayan post office and everyone was eager to help us, but unfortunately we had no luck. I don’t know if it was the insufficiency of the Greek Post Office, the Paraguayan one or the Brazilian customs control, but we never managed to sort out what happened. Fortunately, we have given a Paraguayan friend’s name as the receiver, so if this package is found sometime in the future, our friend Lari will inform us! After having decided to ignore the package and leave, we realized we couldn’t leave! During the previous days, we were trying to figure out what we would do regarding our new tent. 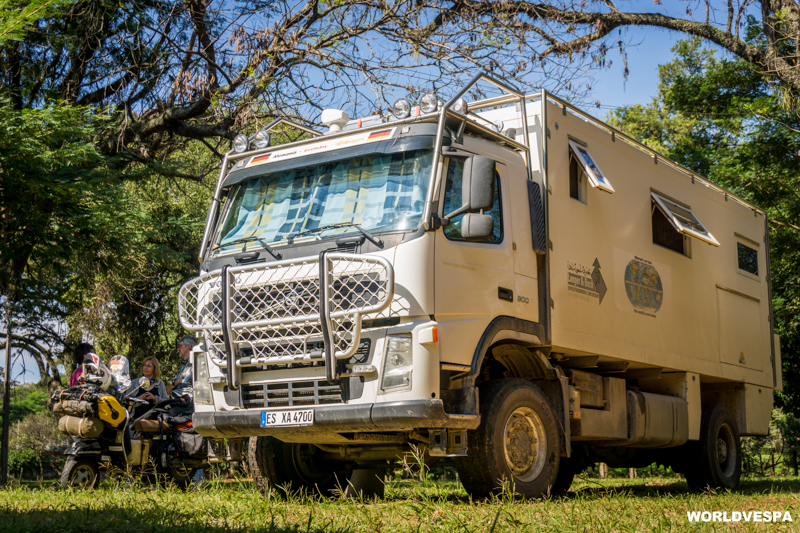 The company (Red Fox) that was eager to provide us with a new tent were trying to send it to us, but when they told us that they were considering sending it by post, we were frightened that we had to stay in Asuncion for ever! Luckily, they sent it to us with a private courier company and in only one week, we had it! I waited and waited for the package from Greece to Paraguay with the post office…even my hair grew long but the package never arrived! / Έβγαλα μαλλιά περιμένοντας εκείνο το πακέτο από Ελλάδα, το οποίο τελικά δεν έφτασε ποτέ! Ready to go, right? – Wrong! Apparently, it was time for me to catch a terrible cold! 3 more days trapped in Asuncion with a painful sore-throat, soups and full of anger! Well, one Friday of June we felt ready to hit the road again. We had everything almost ready, we were both healthy and the vespa was fully rested! The only detail was that all this time that we were in Asuncion, the vespa wasn’t staying with us. We had it safely parked and locked in Diosnel’s business so that the other vespas (that Diosnel collects) would keep it company. 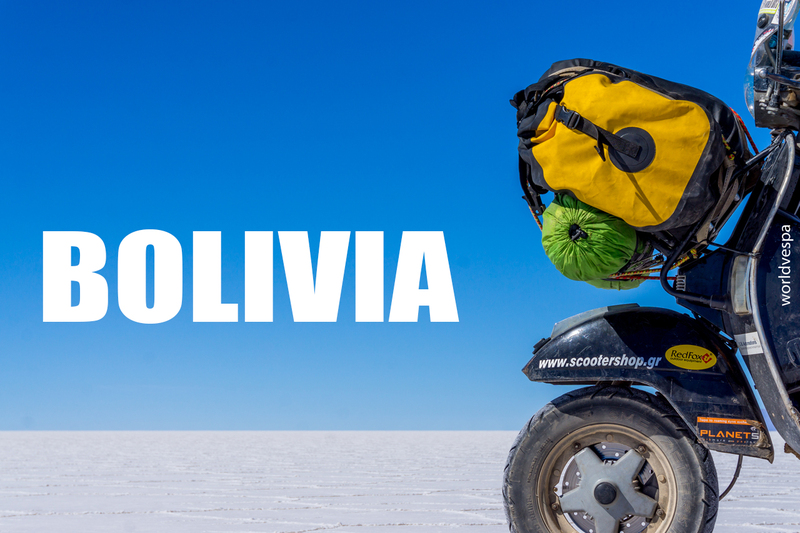 The problem was that Diosnel, his wife and kids had decided to go on a 3-day excursion outside Asuncion and, as we learned after sending him a message, there was no one who could unlock the place and let us get the vespa, until Monday. Be patient…I have to inform you though, that on Monday, after 3 more days of waiting, we did it! We finally left from Asuncion! However, while waiting for the vespa to be freed, we managed to get trapped again, in a more funny way this time! A photographer had somehow heard that a Greek couple on a vespa is somewhere in Asuncion and through some members of the vespa club, asked if he could take pictures of us. He reassured us that they would be strictly for personal use, so we agreed to meet him. We felt that the interview on TV was too much for us, and we were generally uncomfortable with the Media, but Jorge, the photographer wasn’t the Media. We met, he took some pictures and talked a bit about the trip. The real surprise came when, while we were with Jorge next to the riverside, a car with the logo of one of the Paraguayan newspapers stopped next to us. A journalist and a photographer got off the car and started organizing the interview! What interview?! We had no idea and we never managed to figure out whose idea was this interview and who had arranged it! We both silently agreed to give the interview because obviously, it was not the journalist’s fault. The only thing we strongly refused to do, was to pose like a silly couple, giving all the attention to the “love-story” and not to the journey! The interview went well and the journalist, Monica Bareiro, proved to be very professional. For our last 2 days in Asuncion, we had decided to visit for one last time all those places with delicious local food because we knew that we wouldn’t find some recipes anywhere in the world again! Additionally to these gastronomy-walks, we took the opportunity to walk a bit more in the city center and take some last shots. The historical center of Asuncion was one of the most “humane” city centers we had visited. Small, with people who know each other and always say “good morning”. The only “dangerous” situation in the city center of Asuncion is to find yourself behind a bus (and its exhaust), while it’s trying to accelerate! That Monday, we finally departed with no problems. We said good-bye to Diosnel and Elena who had kept the vespa safe and left. 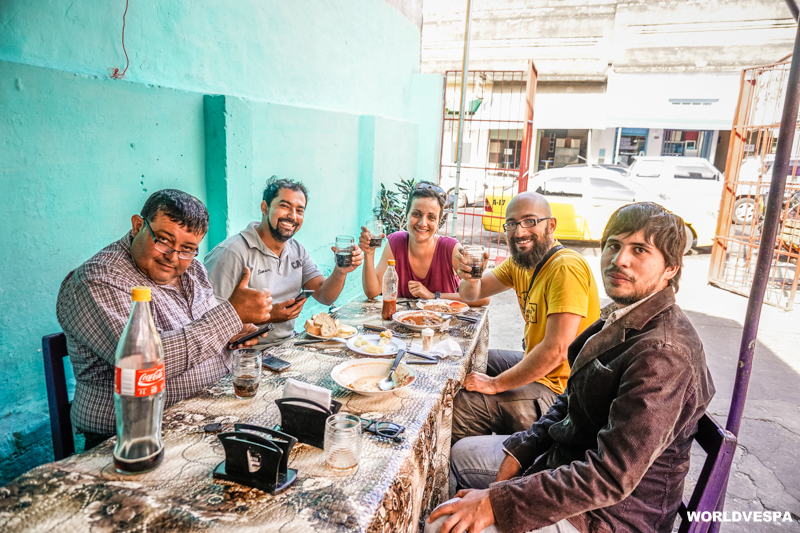 We had the opportunity to say good-bye to many of our Paraguayan friends but unfortunately, we didn’t manage to spend as much time as we wanted with some others…Our memories from Paraguay will be mainly its people! Not only us, but also the Paraguayans think this way: they live in a small country in the middle of South America, next to huge countries with much more developed tourist industry and famous monuments, so they “invest” to themselves! 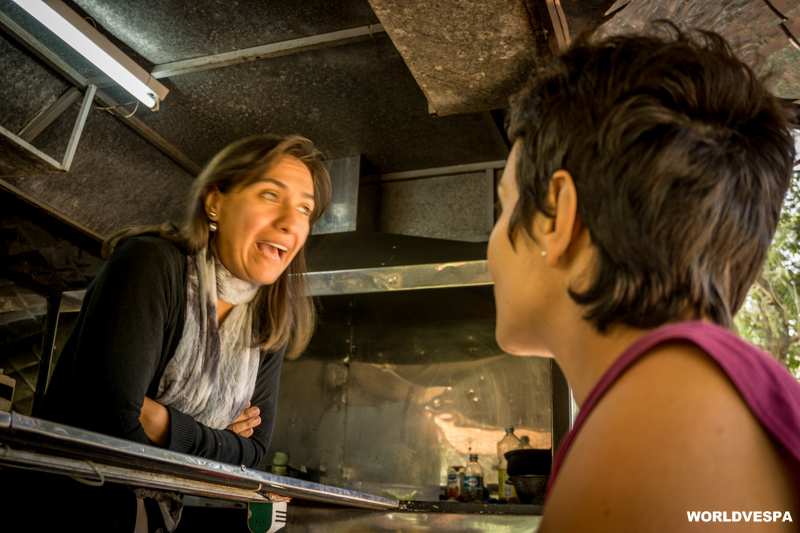 The people’s hospitality and kindness are inarguable for everyone who has visited Paraguay! Στον χώρο του κάμπινγκ δεν ήμαστε μόνοι μας όμως. Όταν φτάσαμε, ένα τεράστιο φορτηγό Volvo, ήταν ήδη παρκαρισμένο εκεί. Φαινόταν ειδικά διαμορφωμένο ώστε να είναι το σπίτι κάποιου που ταξιδεύει, οπότε με περιέργεια περιμέναμε να δούμε τον ιδιοκτήτη του. Σε λίγη ώρα, ένα ζευγάρι Γερμανών, η Ρίτα κι ο Ρούντι, έκαναν την εμφάνισή τους. Είναι και οι δυο τους συνταξιούχοι κι εδώ και κάποια χρόνια ταξιδεύουν με το φορτηγό τους ανά τον κόσμο (www.menrad-international.com). Μιλήσαμε αρκετή ώρα για τις ταξιδιωτικές μας εμπειρίες κι αφού πλέον είχε σουρουπώσει και μερικά εκατομμύρια κουνούπια έδειξαν γι’ ακόμη μια φορά πόσο με προτιμούν, αποσυρθήκαμε στα “σπίτια” μας. Μετά από λίγο, ήρθε κι ο φύλακας του χώρου, ζήτησε τα στοιχεία μας κι αφού μας καθησύχασε πως θα παραμείνει στο καλυβάκι του λίγα μέτρα από εκεί που ήμασταν, μέχρι το πρωί, κοιμηθήκαμε. Το επόμενο πρωί, μετά από κάμποση ώρα σοβαρής συζήτησης για το τί θα κάνουμε με τα πράγματά μας, που επ’ ουδενί δε θέλαμε να αφήσουμε μόνα τους, πήραμε την απόφαση να τα μαζέψουμε και να αναζητήσουμε πιο ασφαλή λύση για το επόμενο βράδυ. Τυχεροί όσοι έχουν οχήματα που μπορούν να κλειδώσουν! Κατευθυνθήκαμε προς την καντίνα που βρισκόταν καμιά 50 μέτρα από εκεί. Στην καντίνα, μας περίμενε η καινούρια μας φίλη, η Αναλία, με ένα παραδοσιακό παραγουάνικο πρωινό! Ποια ήταν η Αναλία; Η Αναλία λοιπόν, ήταν η ιδιοκτήτρια της καντίνας που την προηγούμενη μέρα, καθώς περνούσαμε από μπροστά της για να πάμε προς το χώρο του κάμπινγκ, βγήκε τρέχοντας από την καντίνα της και μας υποδέχτηκε ενθουσιασμένη που βλέπει δυο ταξιδιώτες πάνω σε δίτροχο! Η ίδια και ο άντρας της, που είναι γνωστός οδηγός αγώνων εντούρο στην Παραγουάη, έχουν ταξιδέψει με μοτοσυκλέτα και χαίρονται να βλέπουν ταξιδιώτες στη χώρα τους! Ενθουσιαστήκαμε κι εμείς με τη σειρά μας! Μετά από την άσχημη εμπειρία μας με την κάκιστη γυναίκα από το ξενοδοχείο στο Aregua (βλ. Paraguay (part01)), το να γνωρίζουμε έναν τόσο φιλόξενο και χαμογελαστό άνθρωπο, ήταν υπέροχο! Φάγαμε ζεστό “mbeju”, από τα χεράκια της (το “mbeju” είναι κάτι σαν κρέπα που παρασκευάζεται με αλεύρι από μαντιόκα και παραγουάνικο τυρί σε τηγανάκι πασαλειμμένο με βούτυρο) και αρχίσαμε να συζητάμε. Σε λίγη ώρα, χωρίς να το καλο-συνειδητοποιήσουμε, είχαμε ήδη κανονίσει να μας φιλοξενήσει. Δεν πιστεύαμε πώς ένας άνθρωπος που δε μας γνώριζε καθόλου, ήταν τόσο πρόθυμος να μας βοηθήσει! Οι ευχάριστες εκπλήξεις όμως, δεν τελείωσαν εκεί! Σε λίγη ώρα, ακούστηκε ο χαρακτηριστικός ήχος του κινητήρα μιας βέσπας. Δυο τύποι καβάλα στις βέσπες τους μας πλησίασαν χαμογελαστοί κι εμείς μείναμε να αναρωτιόμαστε πώς μας ανακάλυψαν! Σύντομα, η απορία μας λύθηκε: την προηγούμενη μέρα, καθώς ψάχναμε μέσα στον κήπο για το μέρος που θα κατασκηνώναμε, διασταυρωθήκαμε με μια βέσπα και τον αναβάτη της και χαιρετηθήκαμε εγκάρδια. Αυτό έφτανε! Ο Μαρσέλο (ο αναβάτης) μας αναζήτησε στο ίντερνετ, μας βρήκε και μαζί με τον φίλο του τον Κάρλος, ήρθαν να μας συναντήσουν! Σε λίγο, στην παρέα μας προστέθηκε κι ο Γκουστάβο, ο πρόεδρος του Vespa Club Paraguay. Και κάπως έτσι ξεκίνησε η ιστορία μας στην Ασουνσιόν! Με εξασφαλισμένη τη διαμονή μας, τουλάχιστον για εκείνη τη μέρα, στο σπίτι της Αναλία και της οικογένειάς της, ξεκινήσαμε με τους τρεις βεσπίστες της Ασουνσιόν για μια βόλτα στην πόλη. Κατευθυνθήκαμε στο κέντρο της Ασουνσιόν, περνώντας από την παραποτάμια avenida Costanera, περιπλανηθήκαμε στους δρόμους του κέντρου και καταλήξαμε στο “El Mercadito”, μια κλειστή αγορά με μικρά εστιατόρια που φτιάχνουν αποκλειστικά ντόπιες συνταγές. Παράδεισος! Το ίδιο βράδυ το ραντεβού είχε κλείσει στο σπίτι της Αναλία, όπου ήρθαν κι άλλα μέλη του Vespa Club και φυσικά δόθηκε η ευκαιρία να δοκιμάσουμε – εκτός από το παραδοσιακό “asado” (κρέας στα κάρβουνα) – μερικές ακόμη παραδοσιακές παραγουάνικες συνταγές. Τη “sopa Paraguaya” και την “chipa guazu”, δύο αλμυρά κέικ με υλικά όπως καλαμποκάλευρο, καλαμπόκι, τυρί κτλ, φτιαγμένα από τη μαμά της Αναλία! Είχαμε μείνει έκπληκτοι από τη φιλοξενία των Παραγουανών κι αυτό ήταν μόνο η αρχή! Η επόμενη μέρα κύλησε με παρόμοιους ρυθμούς. Το πρωινό μας ήταν παραδοσιακό – αυγά με κομματάκια μαντιόκας και ζεστό mate cocido. Το μεσημέρι με την Αναλία και τον άντρα της τον Κάρλος Χόρχε, πήγαμε μέχρι το λιμανάκι Remanso, όπου αγοράσσαμε “milanesa surubi” (σνίτσελ ποταμίσιου ψαριού) από ένα από τα “βυθιζόμενα” μαγαζάκια της περιοχής. Όταν η στάθμη του ποταμιού ανεβαίνει, πολλά από τα μαγαζάκια στην όχθη χάνονται κάτω απ’ τα νερά του, ενώ άλλα έχουν προνοήσει και μεταφέρονται στον επάνω όροφο. Το βραδάκι, αφού χαιρετήσαμε τη γλυκύτατη μαμά της Αναλία, τα τρία υπέροχα παιδιά της, τα 5 σκυλάκια και το κατοικίδιο γουρουνάκι(!) τους, κατευθυνθήκαμε προς το κέντρο της Ασουνσιόν όπου μας περίμενε το Vespa Club για την επίσημη υποδοχή! Φαγητό και μπύρα γι’ ακόμη μια φορά! Τώρα η μάζωξη έγινε στο κατάστημα του Ντιοσνέλ, ενός ακόμη μέλους της ομάδας και συλλέκτη βεσπών (και αντικέρ)! Η έκπληξη της βραδιάς, πέρα από τις δεκάδες χαμογελαστών ανθρώπων που μας περίμεναν, ήταν και η μοναδική πίτσα στα κάρβουνα του Ντιοσνέλ…απερίγραπτα νόστιμη! Νόστιμο φαγητό, παγωμένη μπυρίτσα και καλή παρέα γι’ ακόμη μια φορά! Όπως αποδείχτηκε στη συνέχεια, τέτοιες μέρες δε θα αποτελούσαν την εξαίρεση αλλά τον κανόνα στην Ασουνσιόν! Για τις επόμενες λίγες μέρες, ο Ντιοσνέλ και η οικογένειά του μας άνοιξαν το σπίτι τους και μας φιλοξένησαν. Είχαμε αποκτήσει ακόμη μερικούς φίλους στην Παραγουάη! Φοβάμαι πως όσο κι αν προσπαθήσω, κάποιο όνομα θα μου διαφύγει…Πόσοι θέλησαν να μας φιλοξενήσουν – ο Τέντι μας προσέφερε την εξοχική του κατοικία – να μας κεράσουν – όλοι!, να μας δείξουν την πόλη τους, να βγούμε για ποτό…προσπαθούσαμε να μην αφήσουμε κανέναν παραπονεμένο, αλλά ήταν δύσκολο! Ήμασταν μόνο δύο και ήταν τόσοι πολλοί! Για λίγο (μόνο για λίγο), αφήσαμε τη διασκέδαση και είπαμε να κάνουμε καμιά δουλίτσα. Ψάχναμε να βρούμε τρόπο να βολέψουμε λίγο καλύτερα τα πράγματά μας πάνω στη σχάρα της βεσπούλας, γιατί σε κάθε χωματόδρομο το φορτίο κατέρρεε! Αμέσως, ο Κάρλος Χόρχε προσφέρθηκε να μας πάει σε ένα φίλο του, τον Χόρχε Αρμάντο, μεταλλουργό στο επάγγελμα, για να μας βοηθήσει. Σε λίγη ώρα, το βεσπάκι είχε φαρδύτερη πίσω σχάρα με πλάτη για να δένονται τα πράγματα, καθώς επίσης κι ενίσχυση στη μπροστά σχάρα! Φυσικά, την πολύ καλή δουλειά του Χόρχε Αρμάντο, τη γιορτάσαμε με αρκετό κρασί και ψητό κρέας, αφού δε θα μας άφηνε να φύγουμε χωρίς να μας κάνει το τραπέζι! Σε περίπτωση που βαρεθήκατε να διαβάζετε για φαγητά και μπύρες, μη συνεχίσετε με αυτό το κείμενο…κάπως έτσι ήταν η διαμονή μας στην Ασουνσιόν! Φοβηθήκαμε για σάκχαρο και χοληστερίνη! Για να μη γίνομαι μονότονη όμως, θα σας πω και για την πρώτη μας συνέντευξη στα Μ.Μ.Ε. της Παραγουάης – ναι, καλά διαβάσατε, για την πρώτη μας συνέντευξη! Γιατί ακολούθησε και δεύτερη…αλλά θα το δούμε αργότερα αυτό! Χωνεύοντας το γεύμα μας κι ενώ χαλαρώναμε πίνοντας το υπόλοιπο κρασί μας, βρισκόμενοι ακόμη στο εργαστήριο του Χόρχε Αρμάντο, η Αναλία μας πήρε τηλέφωνο και μας ανακοίνωσε πως σε λίγη ώρα δίνουμε συνέντευξη σε κάποιο κανάλι της τηλεόρασης της Παραγουάης! Μικρός πανικός ακολούθησε (δικός μου αποκλειστικά, αφού μόνο εγώ μιλάω ισπανικά, οπότε ήταν σαφές ποιος θα αγχωνόταν να μην απογοητεύσει τη δασκάλα του και ποιος θα γέλαγε με το άγχος του άλλου!) και χωρίς πολλά-πολλά, βρεθήκαμε σε κεντρικό σημείο της Ασουνσιόν με ένα μικρόφωνο και μια κάμερα μπροστά μας να μιλάμε για μας και το ταξίδι μας! Μερικά πλάνα με τη βέσπα κι αυτό ήταν! Ο δημοσιογράφος κι ο κάμεραμαν εξαφανίστηκαν πριν παρκάρουμε τη βέσπα, λόγω φόρτου εργασίας. Η συνέντευξη μάθαμε ότι προβλήθηκε, ωστόσο ποτέ δεν την είδαμε κι ούτε έφτασε στα χέρια μας το βίντεο…Κρίμα, είχαμε μεγάλη αγωνία αν βγήκε ωραίο το χτένισμα του Στέργιου στην τηλεόραση! Η σκηνή όμως ήρθε χωρίς επιπλοκές κι ενώ ήμαστε έτοιμοι να πετάξουμε τα πράγματά μας γρήγορα σε μια βαλίτσα και να φύγουμε τρέχοντας, αποφάσισα να πάθω ένα γερό κρυολόγημα! 3 μέρες με αδυσώπητο πονόλαιμο, κοτόσουπα και νεύρα! Υπομονή…μια Παρασκευή του Ιούνη λοιπόν, όλα έδειχναν ότι θα φύγουμε: οι δυο μας υγιείς, ο καιρός καλός, η βέσπα σαν καινούρια! Μοναδική λεπτομέρεια ότι η βέσπα όλον αυτόν τον καιρό δεν έμενε μαζί μας. Για να μην την έχουμε εκτεθειμένη στους κινδύνους του παρκαρίσματος στον δρόμο, ο Ντιοσνέλ, φίλος από το βέσπα κλαμπ της Παραγουάης, είχε προσφερθεί να μας τη φιλοξενήσει στο μαγαζί του που ήταν ένας τεράστιος φυλασσόμενος χώρος με αντίκες. Έτσι λοιπόν, το προηγούμενο βράδυ πριν την αναχώρηση μας, του στείλαμε μήνυμα για να του πούμε πως το επόμενο πρωί θα περνούσαμε να τον χαιρετήσουμε και να πάρουμε και το βεσπάκι…Αμ, δε! Ο Ντιοσνέλ, μαζί με την οικογένειά του είχαν αποφασίσει να πάνε εκδρομή εκείνες τις μέρες, απλώς είχαν ξεχάσει να αναφέρουν αυτή την πληροφορία σε μας. Παγιδευμένοι λοιπόν στην Ασουνσιόν μέχρι τη Δευτέρα που θα επέστρεφαν από την εκδρομή τους και θα απελευθέρωναν το βεσπάκι! Για να μην γίνομαι κουραστική, ενημερώνω πως ναι, τελικά εκείνη τη Δευτέρα φύγαμε! Όμως, πριν φύγουμε καταφέραμε και ξανα-παγιδευτήκαμε, αλλά αυτή τη φορά με αστείο τρόπο! Ένας φωτογράφος είχε μάθει πως ένα ζευγάρι Ελλήνων με μια βέσπα κυκλοφορεί ελεύθερο στην πόλη, οπότε μέσω κάποιων μελών του βέσπα κλαμπ, μας ζήτησε να μας φωτογραφίσει. Μας διαβεβαίωσε πως είναι για το προσωπικό του πορτφόλιο κι έτσι συμφωνήσαμε να συναντηθούμε – ήδη η εμφάνιση στην τηλεόραση ήταν κάτι “έξω απ’ τα νερά μας”, οπότε το να συμμετέχουμε σε φωτογράφιση, ακουγόταν επίσης υπερβολικό για τα δεδομένα μας. Όντως, συναντηθήκαμε με τον Χόρχε τον φωτογράφο. Όντως έβγαλε μερικές φωτογραφίες και συζητήσαμε γενικώς και αορίστως για το ταξίδι, τη βέσπα και το επάγγελμα του φωτογράφου. Η έκπληξη ήρθε αργότερα, όταν εκεί που ήμαστε, σταμάτησε ένα αυτοκίνητο με το λογότυπο μιας εφημερίδας της Παραγουάης και μάλιστα μεγάλης κυκλοφορίας! Από το αυτοκίνητο βγήκαν ένας φωτογράφος και μια δημοσιογράφος που ήταν έτοιμοι να μας πάρουν συνέντευξη και να μας φωτογραφίσουν. Δεν είχαμε ιδέα γι’ αυτό και ποτέ δεν καταφέραμε να καταλάβουμε ποιος το κανόνισε και πότε! Στην αρχή ενοχληθήκαμε, αλλά αφού δεν ξέραμε σε ποιον να επιρρίψουμε την ευθύνη κι αφού η δημοσιογράφος δεν έφταιγε σε τίποτα, αποφασίσαμε να δώσουμε τη συνέντευξη. Το μόνο πράγμα που αρνηθήκαμε ήταν να δώσουμε έμφαση στο “λοβ-στόρυ” μας και να σχηματίσουμε καρδούλες με τα χέρια μας κι άλλα σαχλά. Τελικά, η δημοσιογράφος αποδείχτηκε εξαιρετική επαγγελματίας κι όταν εκδόθηκε η συνέντευξη και τη διαβάσαμε, εκτιμήσαμε τον επαγγελματισμό της. Οι τελευταίες μας 2 μέρες στην Ασουνσιόν πέρασαν με δυσπεψία, αφού ξέραμε πως μερικά από τα παραδοσιακά πιάτα της Παραγουάης δε θα τα ξανασυναντούσαμε. Μερικές ακόμη βόλτες στο κέντρο της πόλης που τόσο μας άρεσε, ήταν επίσης επιβεβλημένες! Άλλωστε το ιστορικό κέντρο της Ασουνσιόν ήταν ένα από τα πιο “ανθρώπινα” κέντρα πρωτεύουσας που έχουμε επισκεφτεί (το μόνο “απάνθρωπο” ήταν να βρεθεί κανείς πίσω από λεωφορείο την ώρα που ζορίζεται να ξεκινήσει στην ανηφόρα…). Έτοιμοι πια, με καινούρια σκηνή και με τη βέσπα μας απελευθερωμένη από τα δεσμά της, ξεκινήσαμε. Πολλούς από τους φίλους μας στην Ασουνσιόν δεν προλάβαμε να τους χαιρετίσουμε. Άλλους πάλι, τους “χαιρετίσαμε” αρκετές φορές με μπύρες και μπάρμπεκιου. Σίγουρα, οι αναμνήσεις μας από την Παραγουάη θα είναι κυρίως γεμάτες από το “ανθρώπινο στοιχείο” της χώρας αυτής. Άλλωστε, κάπως έτσι σκέφτονται και οι ίδιοι οι Παραγουάνοι: ζουν σε μια μικρή χώρα στο κέντρο της Νότιας Αμερικής που δεν έχει τη φήμη των γειτονικών τουριστικών “μεγαθήριων” με τα μεγαλόπρεπα τοπία και την τουριστική βιομηχανία. Αυτό όμως στο οποίο μπορούν να “επενδύσουν” οι Παραγουάνοι, είναι οι άνθρωποι, οι φιλόξενοι και ανοιχτόκαρδοι άνθρωποι που θα κερδίσουν τις εντυπώσεις του κάθε επισκέπτη. Καταπληκτικές φωτο, ομορφη διηγηση. Θα μπορουσα να ρωτησω τί εξοπλισμο εχετε απο καμερες; Ευχαριστω και καλη συνεχεια! Ο εξοπλισμός μας αποτελείται από την Drift Ghost S με την οποία γράφουμε τα βίντεο και από 2 Sony A6000 για τις φωτογραφίες.